Johnny Chan is one of the best poker players in the world and a true veteran of the World Series of Poker. He has been a champion since the 1980’s and has continued to be a successful player. Johnny Chan and his family moved to the United States of America in the late 1960’s from Canton China. They lived in Phoenix and then in Houston where Mr. Chan worked at his families business; His parents were business owners owned and operated a restaurant. When Chan was young, before becoming a poker player Chan like to frequent Bowling Allies. When Johnny Chan discovered the game of poker he began to play very small games with friends. Later Mr. Chan discovered that there were underground poker games in his family’s restaurant where he used to work. Johnny Chan played poker with his fathers friends and won; his father’s friends told him that there were no more games. This was not true, the reason they said this is because they were continually losing money to Chan. The online poker review sites say that Johnny Chan was a skilled poker player at the age of sixteen and decided to go to Las Vegas with a small bankroll of five hundred dollars. The reason I say small is because he turned the five hundred dollars into twenty thousand dollars. Johnny Chan went to they University of Texas with a concentration on hotel and restaurant management. Chan dropped out with the ambition to become a professional poker player. At the time many of the online poker review sites say that he went to work on controlling his temper, Mr. Chan was headstrong and knew that it was a weakness. Johnny Chan entered Bob Stupak’s America’s Cup Tournament and eliminated 13 or his 16 opponents; the online poker review sites say that this is where he got the nickname the “Orient Express”. Many poker experts say that his greatest achievements were in the World Series of Poker in the late 1980’s. The owner of the Los Angeles Lakers; Jerry Buss was a poker player and Chan a NBA Championship ring if he could three-peat, which he nearly did, finishing second to Phil Hellmuth Jr. in 1989. 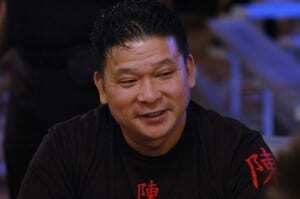 Johnny Chan has won countless tournaments and was inducted into the Poker Hall of Fame in 2002. Chan was appeared in two films Rounder’s with Matt Damon and Lucky You. He has also worked jointly with Mark Karowe on 2 poker books, Play Poker Like Johnny Chan and Million Dollar Hold’em: Winning Big in limit Cash Games.